As Chief Instructor and Founder of the BMAA, Kevin is responsible for the initial vision and intentions of the organisation. Along with ensuring the safety of all members, support for all instructors and running classes and seminars, it is also Kevin’s role to ensure the organisation is heading in the right direction. The standard of instruction and consistency within the association are Kevin’s highest priorities, these aspects are what set us apart from others and ensure all members have the opportunity to get the best out of themselves. Joe Pletersky is the Assistant Chief Instructor of the association. Joe’s support and knowledge truly helps us set ourselves apart from other organisations, with a wealth of knowledge gained over many years Joe is always there to help other members and instructors. 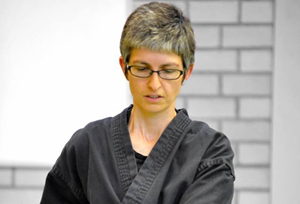 Dessi started with Bushido Hombu in 2015 after completing a 6-week ladies’ self-defence course run by Kevin Archibald Sensei. Even though her initial motivation was mainly the self-defence aspect of karate, what has fascinated her ever since is how karate can work as a way of approaching and understanding life, a mindset which leads us to develop ourselves as persons. She especially enjoys kata because it combines all sides of karate in discrete yet ever evolving self-contained forms. Dessi has spent most of her professional life around books, having worked in libraries and owned her own bookshop. Currently, however, she is focusing on completing her MA in Continental Philosophy. Outside of karate Dessi enjoys music, art, walking and hiking and being closer to nature and further away from the urban way of life. Alex interest in martial arts started in his early teens when he joined a local Tang Soo Do (Korean Karate) club. After he finished school he spent more time immersing himself in martial arts training, initially Yang Style Tai Chi and later on Shaolin Kung Fu. He pursued this training throughout his twenties and it eventually led him to train in China at the birthplace of Kung fu – Shaolin Temple. Setting up his own Traditional Chinese Medicine and Acupuncture practice and starting a family kept Alex from training for many years. However, he wanted to introduce his children to the benefits of martial arts and started training at Bushido Hombu. 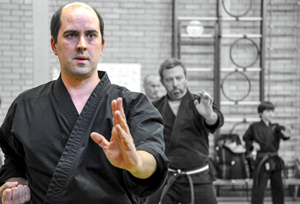 Alex has studied a variety of styles of Kung Fu, and Tai Chi over the years as well as Jujitsu and Won Hwa Do. He tries to bring experience and a different perspective to his karate training.